"Jesus asked his disciples, 'What were you discussing out on the road?' But they didn’t answer, because they had been arguing about which of them was the greatest. He sat down, called the twelve disciples over to him, and said, 'Whoever wants to be first must take last place and be the servant of everyone else' (Mark 9:33-35). When Jesus saw what was happening, he was angry with his disciples. He said to them, 'Let the children come to me. Don’t stop them! For the Kingdom of God belongs to those who are like these children. I tell you the truth, anyone who doesn’t receive the Kingdom of God like a child will never enter it.' Then he took the children in his arms and placed his hands on their heads and blessed them" (Mark 10:13-16). Those disciples sure got it wrong sometimes! These are only two of the many examples the gospel writers share. There's also the time they wanted to destroy a town for not welcoming them, the time Peter tried to dissuade Jesus from following the course laid out for Him, Peter's denial that he knew Jesus...These men were just ordinary men, trying to figure out how the world worked now that Jesus had come and they got it wrong a lot. Jesus upended the normal way of seeing the world and the disciples had a hard time making that adjustment. It can be hard for us, too. We all want to be 'the greatest' sometimes. We want to take the easy road rather than walking head on into the hard things. We hide when we're scared. The beautiful thing is that Jesus didn't abandon the disciples because they made mistakes. He didn't send them away and start looking for better followers. He reprimanded them, scolded and corrected them and probably shook His head in frustration a million times that aren't recorded in the Bible, but He also kept teaching them. He continued patiently showing them how God's kingdom works and what should be important to those who seek Him. Thankfully, He's just as patient with us when we get it wrong. 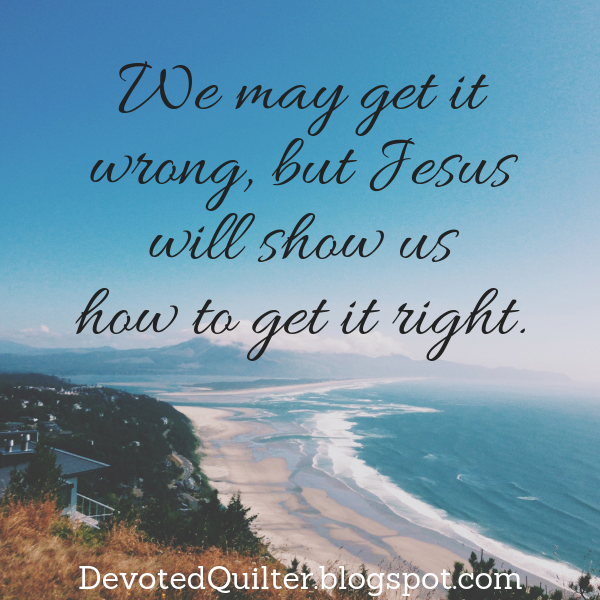 The Holy Spirit will show us when we're wrong or a friend will lovingly point it out, but Jesus never sends us away. We are His and no mistake we make is bad enough for Him to stop teaching us how to get it right.